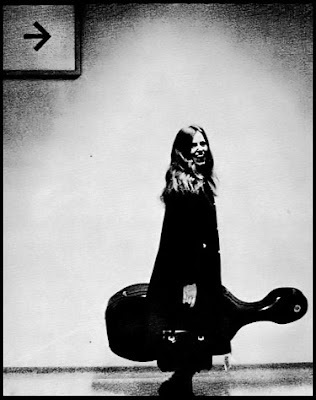 It's not to my credit that the first thing that caught my eye in this marvelous photo of British cellist Jacqueline du Pré was the handbag. To make amends to one of the most brilliant performers ever, let's backtrack and pay homage where it is due. I don't have any details on the picture itself but it's surely taken en route between concert halls. She is the picture of perfect happiness, Alice in a wonderland of virtuosity made and met. She fairly crackles with vitality: huge smile, streams of strawberry-blonde hair, instrument endearingly turtle-shaped at her side. You can read the full story of her life here. This is how it ends: her career was finished at 28 by multiple sclerosis; she died less than twenty years later. A short glimpse of her genius, in this performance of Elgar's Cello Concerto --conducted by Daniel Barenboim, with whom she had a torrential love affair and married. And now, less guiltily, on to the bag . . .
to my eye it's a dead ringer for those made by 60s manufacturer Bienen-Davis. Here's one currently for sale on eBay, many thanks for the picture, Trish. What I love about this company's bags is their neatness, containment, understatement. Perhaps du Pré liked this as well? 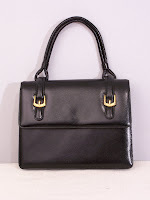 While she was close to bursting with the scope of her talent, the bag in her hand was tidy and elegant. Now that's what I call style with brains! Have you read the book, or seen the film, Hilary and Jackie? Highly recommended. What a lovely and talented woman she was. I too highly recommend the film Hilary and Jackie. And that bag is fabulous! will have to watch H&J again . . . but these youtube clips are fab as well--many more if you're a JdP fan . . . thanks for commenting!